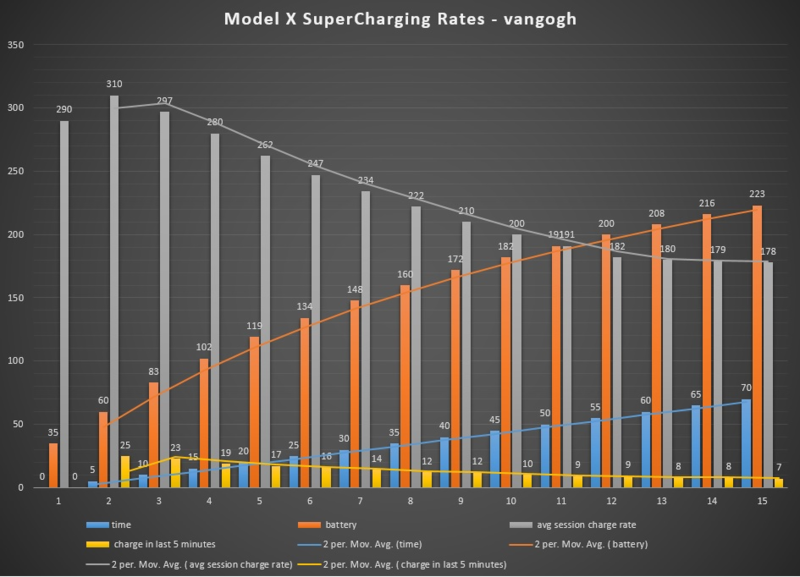 Discussion in 'Model X: Battery & Charging' started by vangogh, Feb 5, 2016. The displayed charge rate in miles of range/hour is an average for the session, not instantaneous. The kW display will give an instantaneous rate. Interesting. I am surprised that it tapers so early on. I thought it was more linear until approx 50-60%. My same experience in New Hampshire. I suspect you'll do better, warmer weather, warmer batteries charge faster. why are you bothering to chart a moving average of a moving average? The MPH display is already a moving average. Only KW is instantaneous.